Fake Leslie-style tremolo and chorus effects (it does audibly speed up and slow down, but there's no slow to a halt effect) for the upper- and lower-manual traditional organ voices. Celeste effects for the different tone generators (a strange stereophonic detuning and phasing effect—if used in combination with the tremolo it sounds rather like you're going for a ride around on a carousel with a pipe organ in the middle). (Both the Leslie emulator and the celeste effect do their business by amplitude, frequency, and phase modulating the sound between the different speakers around the cabinet.) Harmonic couplers for the lower keyboard (blue buttons). 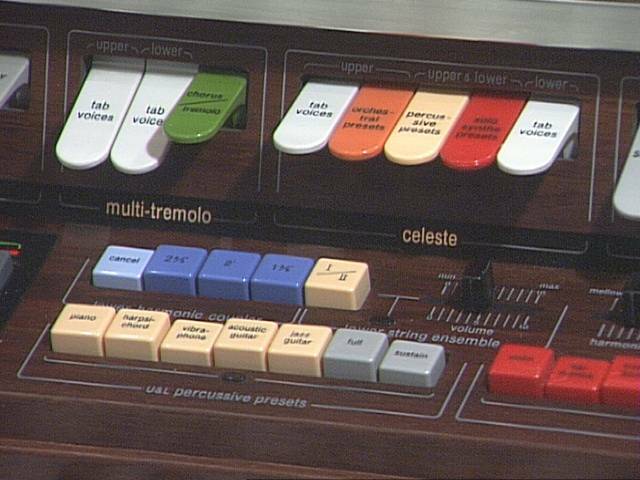 And upper- or lower-manual percussive instruments (yellow buttons).